Michael Hoey was disqualified for signing for an incorrect score. Photo Eoin Clarke/www.golffile.ieJust when Michael Hoey thought he could see light at the end of the tunnel, he ended up buried alive - disqualified for signing for a wrong score just hours after believing he’d shot one of the best rounds of his career. On a day when Rory McIlroy avoided his tendency to throw in the towel and avoided the general carnage by carding a 75 that left him just two shots off the lead, Hoey’s first US major went from triumph to disaster. The 33-year old from Belfast followed his opening 78 with a brilliant 70 - the second best round of the day and just one of five sub-par scores recorded - to triumphantly make the cut with two shots to spare on four over. A few hours later he was disqualfied for signing for an incorrect score, having alerted officials to the fact that he had failed to recreate his lie after identifying his ball on the eighth, when it became deeply embedded in a sandy area. “In an effort to identify the ball as his, he brushed away sand, as allowed under Rule 12-1a. However, Hoey failed to re-create his lie by replacing the sand on his ball, as required in the procedure of this Rule, thus incurring a two-stroke penalty for breach of Rule 12-1. Unfortunately, Hoey failed to include this two-stroke penalty in his score for the ninth hole (sic), signed and returned the incorrect score card, for which the penalty is disqualification. This ruling would be the same for a ball lying anywhere on the course covered by sand; including a sand dune, a sandy beach in a water hazard or a bunker. McIlroy was pleased with his round and the way he adjusted to winds gusting up to 30 mph. Graeme McDowell is tied for 11th on level par after shooting 76 in the morning and while and felt the course could not have played much tougher, he’s right where he wants to be going into the weekend. “It’s one of the toughest setups I think I’ve seen at a major championship in a long time,” McDowell said. 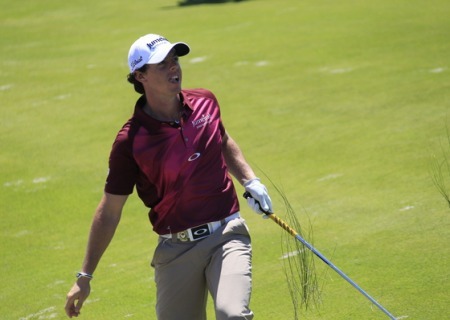 “They didn’t put the tees very far forward. The pin on 14 and the pin on 17, I’m not sure how you get within 20 feet of those. It was just about setup. As it turned out the wind didn’t die down and he’s only four behind Singh, Tiger Woods and Carl Pettersson. Darren Clarke relished the windy conditions and made the cut with a shot to spare on five over after adding a 76 to his opening 73. He was cruising at two under following birdies at the fifth and sixth but bogeyed the ninth and double bogeyed the 10th to complicate matters before bogeys at the 14th, 16th and 18th left him sweating. When he’d found his ball embedded, Hoey had wanted to call a rules official to confirm he wasn’t entitled to free relief. However, the group was on the clock and one of his playing partners, Kevin Na, a Korean with a reputation for slow play, convinced Hoey to press on. “At the time, I’d no idea that I was required cover the ball again,” he said. “All I needed to do was sprinkle a few grains back on top of it and that’d be fine. “I really should have called for one of the rules guys but Kevin Na told me he knew I wasn’t entitled to relief and kind of rushed me a little bit,” Hoey explained. McIlroy becoming golf's Mr Magoo? Michael Hoey will play in next week’s US PGA after securing a late invitation from the PGA of America.Michael Hoey may not have cracked the world’s top 100 but he will still get to tee it up in next week’s US PGA at Kiawah Island. 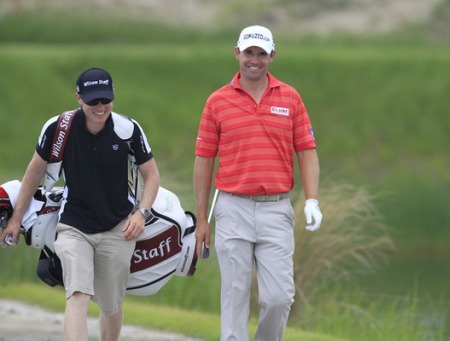 Padraig Harrington and his caddie, Ronan Flood, walk happily at Kiawah Island this week. Photo Eoin Clarke/www.golffile.ieGolfers, like most sportsmen, are often at their most interesting in moments of frustration or failure. Triumph is a quick high but the buzz soon wears off. In contrast, the pain of defeat, and the soul-searching it provokes, can often provide a deeper insight into the psyche of the top level athlete.